March finished with a flourish of repairs, callouts and servicing. The usual unpredictable joy of our lives carries on, with forklifts being introduced to sectional doors and roller shutters plus a highspeed door deciding the safety features where no longer needed plus others. Because at C & N we hold specialisms in a variety of door types, we have successfully been able to repair various types of industrial doors, while we offer our own branded doors highspeed doors, we can also service and repair many other makes. This particular highspeed door for one of our Hull based clients, provides essential sound insulation for a busy production area and needed to be back up and running as soon as possible, we were able to ensure the door was open and production could continue as efficiently as possible. Another very urgent callout we attended was on an insulated roller shutter where the client had informed us that during the nightshift the door somehow had become bagged up and not coming down. When our engineers arrived onsite it was found that the door was bagged up and loose and all the top straps had bee broken, leaving the roller shutter door in a dangerous state. We were able to safely remove the roller shutter door from the hood and made the essential repairs and have it all up and running in the same day for the Hull based client. A client in Grimsby who’s forklift driver had struck a roller shutter and unfortunately attempted use the door damaging the roller shutter further, we were able to attend site, strip it down and carry out the repair on the same day, ensuring the factory could be secured at the end of the day. We were called out to Sheffield for an urgent job where belts had snapped on a highspeed door in a very busy food production area, again our engineers were able to get to site make the area safe and ensure the client could keep the area operational and make the repair with minimum downtime for the client. These jobs are in addition to our regular servicing, ensuring our clients roller shutters, sectional doors, highspeed doors etc are all up to specification and work safely and efficiently. If you are based in the Yorkshire or Lincolnshire areas and need an efficient, professional and thorough service do not hesitate to give C & N Doors Services a call on 01482 666662. Happy New year to all our clients both current and soon to be. 2018 ended in a rush, as it always does, with customers eager to have repairs and installs all completed due to the Christmas rush, and with a lot of our clients in the food sector, this is by far their busiest time of the year. The Christmas break gave us time to reflect on the year that’s just gone, some of the successes and look where we can improve. With the office closed we still provided a call out to our clients, having to attend a number of sites during the break, all sectional doors at food factories, roller shutters at car sales and Barton Football club all needing to get up and running again. Possibly the most critical of these was Barton, due to this door allowing access to the bar from the stands! 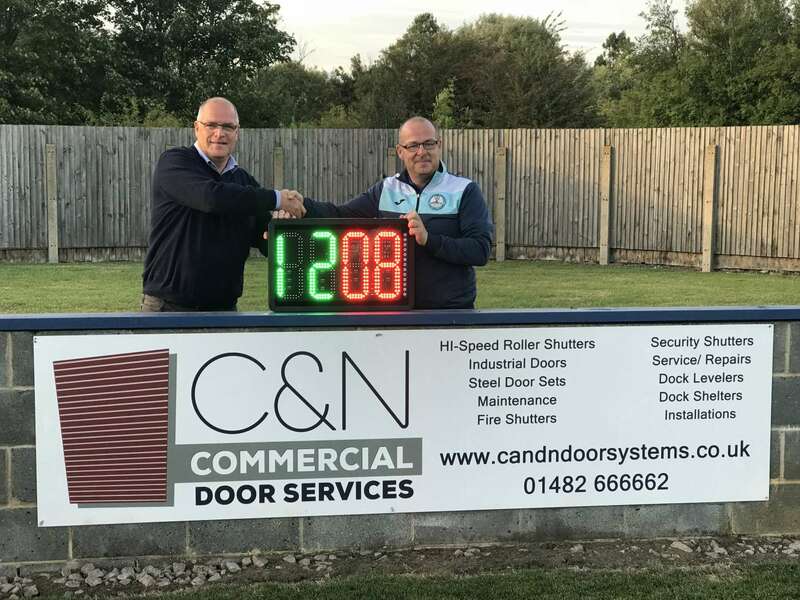 C & N are proud sponsors of Barton Football Club currently playing in the NCEL Premier league. We’ve recently bought them a new digital substitute board which is already being put into good use. 2019 will see us at C & N Provide an expert service to our clients and with an expanding team of professionals and product portfolio being able to a one stop solution for you industrial doors and loading bay accessories, we are able to provide the door, dock shelter, dock leveller, protection posts, dock buffers and all relevant safety equipment. C & N’s New Director Ruby opens door to success.